Pull off all stem leaves that will be covered by vase water. In a water-filled basin or bowl submerge flower stems, and cut them diagonally with scissors. This simple step will eliminate stem-clogging bacteria. Cut the stems by about 1.5 - 2 cm (0.5 - 0.8 inches). You can add the flower food into the vase, which should be dissolved in warm water. Top off water daily and replace totally after several days. Flowers like to be spray misted..
Make sure your vase is leak proof, and has a neck and water reservoir large enough for your flowers to fit comfortably. Roses need more water than other flowers - upto 3/4 of the vase height. The height of your vase should be about half to one-third as tall as your flowers. 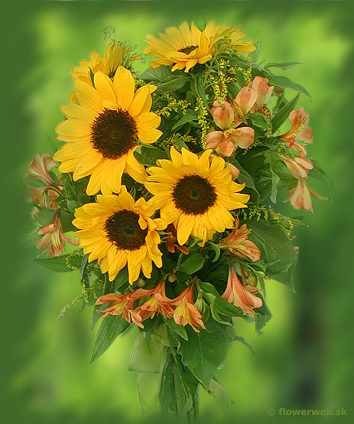 Beautiful bouquets and flower arrangements can be shown off in many different types of vases and containers. The possibilities are endless - from an antique teapot or brass urn, to an elegant crystal vase, or a simple glass jar. Avoid containers made of steel or iron. Display your flowers in a cool, draft-free location, away from direct sunlight and heat vents. Don't set flowers on top of a TV. Top off water daily and replace totally after several days. When you're down to your last few blooms, change to a smaller vase. Always use clean vases or containers. Remove all leaves which will be under water in the vase. Submerged leaves will rot and could create bacteria, shortening the life of your bouquet. Cut the stem of each flower under water using a sharp knife or scissors. This prevents air pockets from forming inside the stems which block water to be absorbed into the flowers. Recut every three days or so. Change the water every three to four days. You can add floral food, obtained from your local florist, to the vase water. Use the recommended amount for the size of your bouquet.